Garmin makes the best portable navigators out there. Millions of people, including me, are fans. But following notoriously lengthy delays, the first Nuvifone should have been euthanized, not put on AT&T shelves next to the iPhone—for $100 more. The Nuvifone G60 GPS phone is out this week for $300, an absurdly high price for even a smartphone in this age. But the Nuvifone is not a smartphone, not even a clever one. • The resistive touchscreen reminds me of phones circa 2006, bad for everything but big-button tapping. • There's no homescreen button, to quickly take you out of a mire of menus. • It's crashy—screens froze twice while I was writing this, forcing a full-on hard restart. • Sometimes the accelerometer just stops working completely. • The camera is terrible—if the hardware button required for the shutter even works—and there's no video of any kind. • The web browser is all but useless, because it relies heavily on zooming in and out, and the touchscreen easily confuses swiping and tapping. • The interface looks cool at first, but there are strange design choices throughout. Want an example? The QWERTY keyboard only appears in horizontal mode—it's ABCDE in vertical mode. Also, no "Where To?" button, a la older Nuvi devices. • You have to pay a $5/month premium charge to check the weather, traffic, local events and other services—all of which can be found on free apps from real smartphone platforms (not just iPhone). • Even when using email (let alone calendar), there doesn't seem to be any awareness of the rest of the internet: The email wizard lets you enter any address and password, but it doesn't say whether it can actually get mail. This tenacious little phone is still trying to log onto my Hotmail account. • The battery ran down completely during my first day of testing, after a few phone calls and some modest GPS navigation, and the battery indicator drops fast when it's just on standby. In fairness, you shouldn't use this phone or any other phone without a car charger, if you intend to use it for GPS navigation. • There is no car charger. It's missing the $7 USB-to-cig-lighter adapter. AT&T probably wanted to sell it separately, but when I asked at my local AT&T store, they didn't even carry it. • Since it's an AT&T phone, it has to compete with the iPhone and other handsets that are way better. If the Nuvifone were on Verizon, it would at least have a network advantage in certain markets that it could lord over the iPhone herd. But even Apple haters would have a hard time spending an extra $100 on this—with the exact same phone reception. 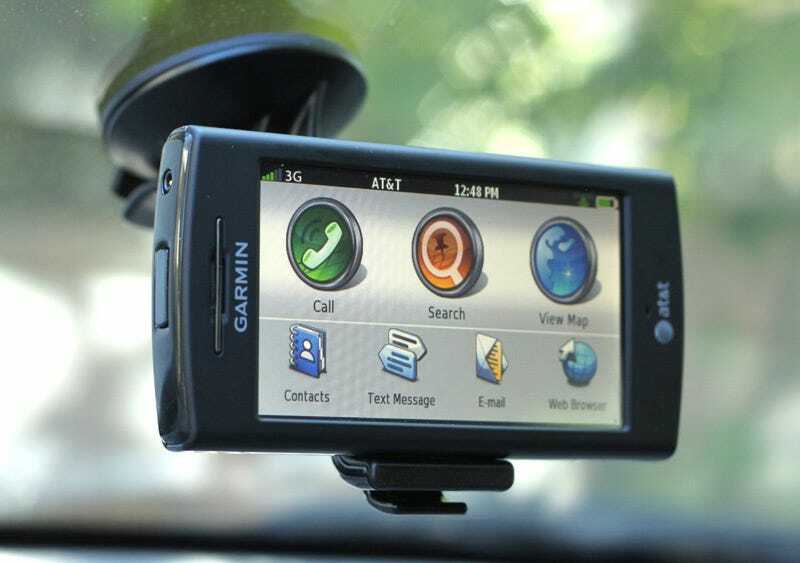 Garmin: Please get your act together in the phone space. You have two choices: Either make tidy useful navigation apps for the major platforms, or make real phones. There's no such thing as a PND that also makes phone calls (though I think that was the original plan for the G60). You are great in your field, but even teamed with Asus, you aren't better than the lowliest phone maker, so you have to play catchup: Pick a mobile OS and stick with it. Skip Windows Mobile (for now) and make a serious push into Android. To do that, you'll have to see what everyone else is doing. Don't just set yourself up to lose in the end to an HTC running a TeleNav or TomTom app. You're good at making tough hardware, so why not differentiate with a rugged outdoor Android smartphone? I urge you to re-consider your premature departure from the mobile app business. Garmin brand equity would sell a lot of iPhone apps, especially if they came with the Nuvi interface most people love more than TomTom's or Navigon's. It may bruise the ego a bit to focus on software instead of hardware, but I just don't see how successful you can be by doing what everyone else is doing, only later and worse. I didn't mean to be this harsh, but I also didn't expect the G60 to be so bad.